History runs deep for the St. Augustine Art Association. Literally! 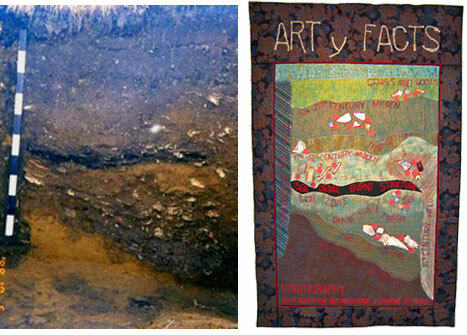 When the Art Center was expanded in 1998, City Archaeologist Carl Halbirt conducted an archaeological study of the site before construction. He opened six test units—three beneath what would be the South Gallery and three beneath the present-day North Gallery. 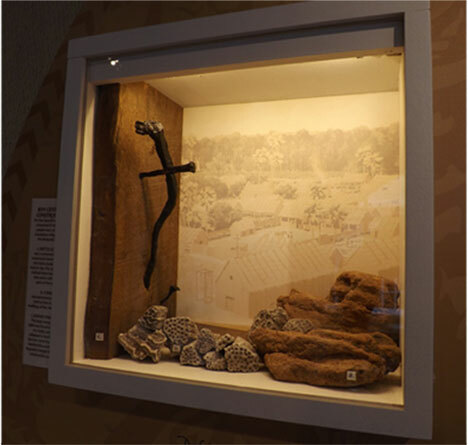 Under the North Gallery, he discovered an undisturbed collection of 16th century Spanish and Native American pottery, a variety of building materials, a sewing needle and charred organic matter. 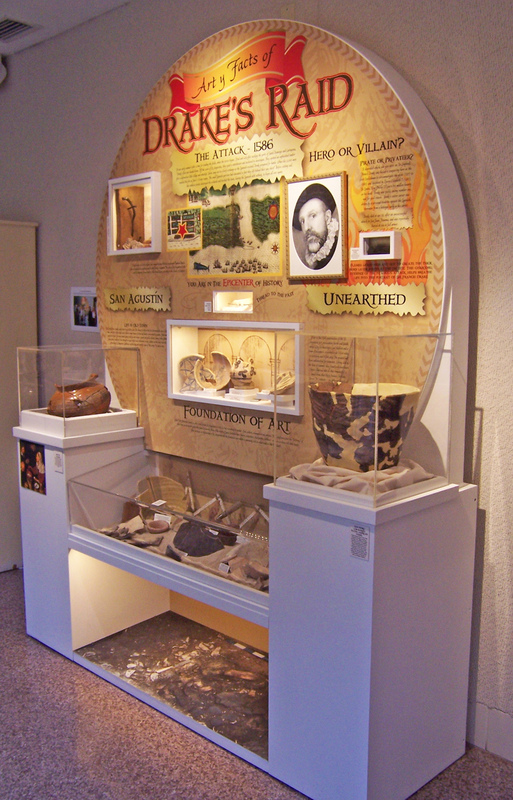 Based on stratigraphy findings and other historic and scientific data, Halbirt determined this “unparalleled” assemblage of artifacts was “de facto evidence” of Sir Francis Drake’s 1586 Raid on St. Augustine when the town was burned to the ground. 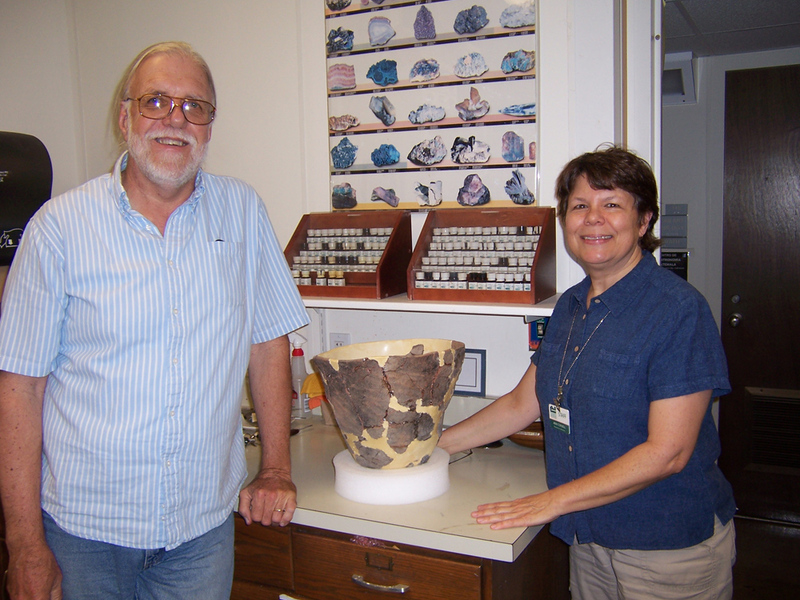 The City Archaeology Department inventoried hundreds of artifacts and stored them for more than a decade until the St. Augustine Art Association received a grant from the Florida Humanities Council to create an interpretive exhibit as a legacy project for the City’s 450th Anniversary. Under the scholarly direction of Halbirt and with input from Anthropologist Sarah Miller and other experts, a creative team was assembled consisting of a research/writer, graphic designer, portrait artist, fiber artist, calligrapher and woodworker. 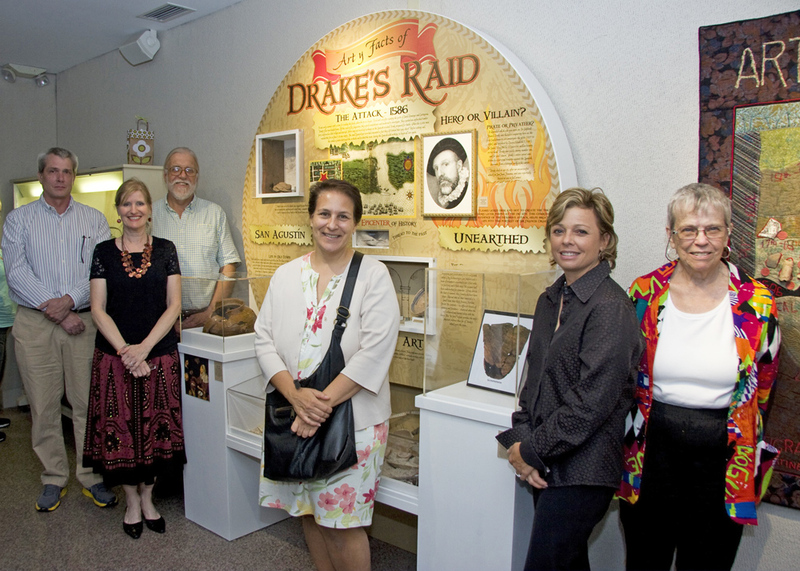 They endeavored to develop a beautiful, compelling exhibit that would preserve the artifacts, tell the Drake story and explore the connection between the artisans of the past and those of today. Permanently installed in the art gallery directly above the site that yielded the artifacts, the Art y Facts of Drake’s Raid (the “y” is a nod to the Spanish word meaning “and”) presents the archaeological discovery in a large circular motif, which represents Drake’s circumnavigation of the globe and the cycle of creativity. 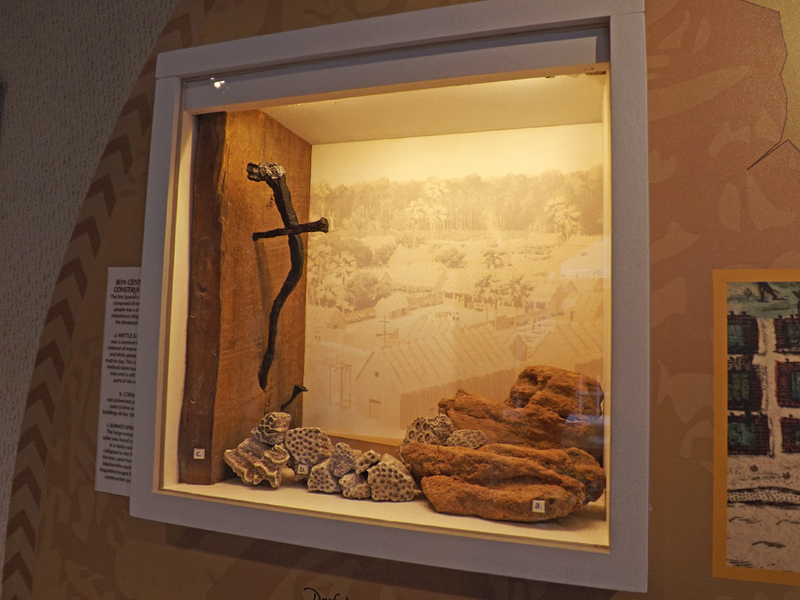 Artifacts on display include a reassembled European cooking pot, a five-pound San Pedro marked vessel–the largest Native American pot of its kind found in the Southeast. Samples of fancy decorated Spanish tableware, along with utilitarian pottery pieces are also displayed. 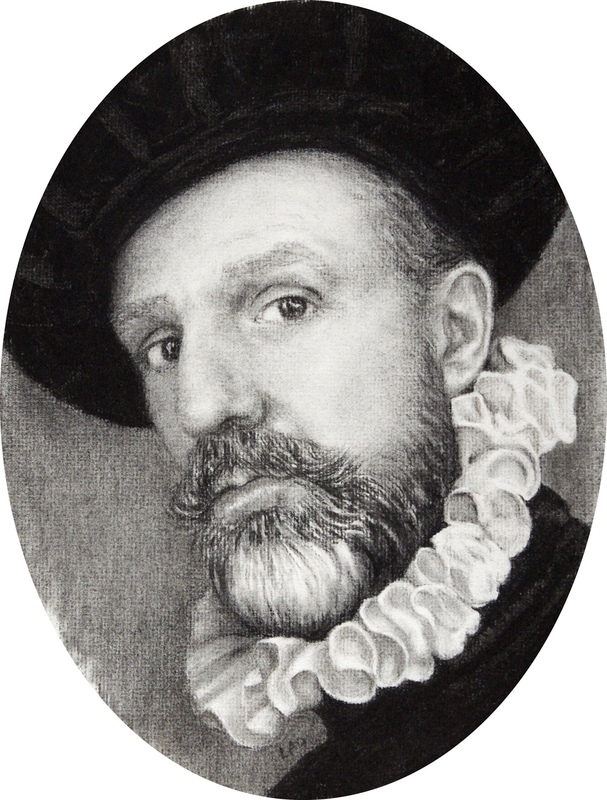 The focal point of the exhibit is an original portrait of Sir Francis Drake by award-winning artist Lisa O’Neil, who used charcoal from the excavation to create the drawing. This commemorative St. Augustine 450th Anniversary legacy project was produced in part through a grant from the Florida Humanities Council. Visit soon! 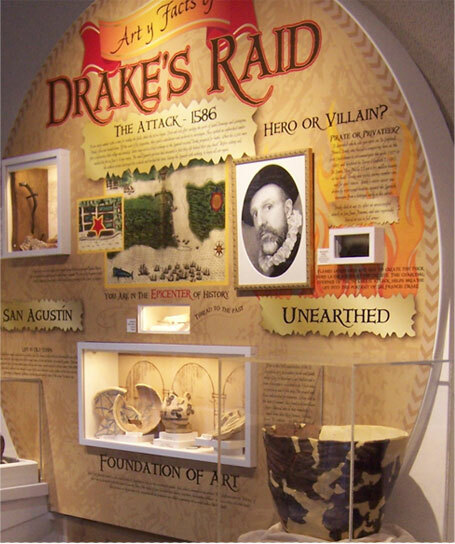 Download the smARTcards for fun facts and activities about Sir Francis Drake and his raid on St. Augustine. Use this hands-on curriculum to explore the connections between art and archaeology through history. The lessons and activities have been developed so that they are suitable for children of all ages. ART y FACTS OF DRAKE’S RAID. The rare 16th Century artifacts on permanent display were unearthed just three feet under the floor! This discovery is the archaeological signature of Drake’s 1586 attack. 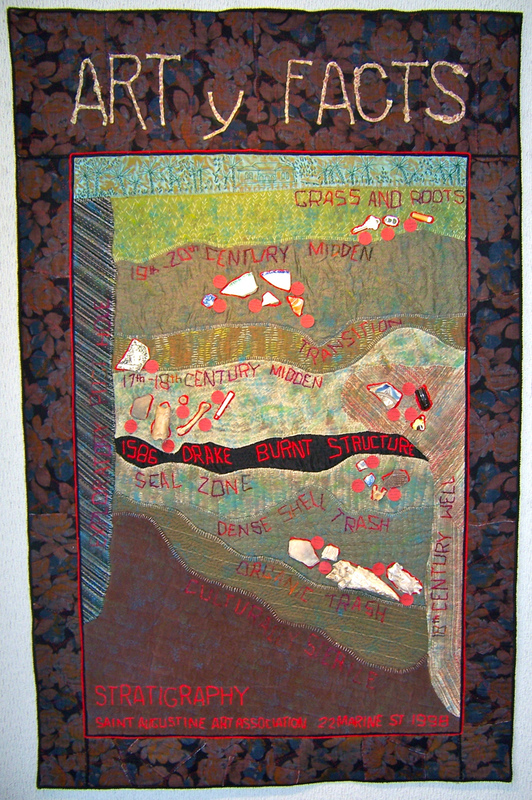 STRATIGRAPHY QUILT. Created by fiber artist Mary Rhopa la Cierra, the touchable quilt is embellished with real artifacts from the dig. 16th CENTURY BUILDINGS. 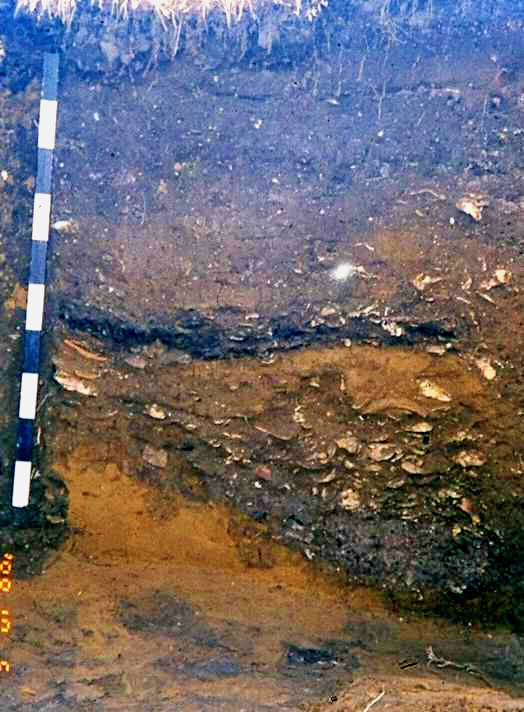 Coquina, coral and forged nails were used in construction. The faded background shows an artist’s interpretation of the original town.